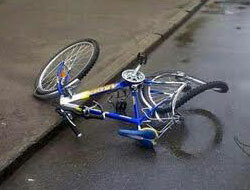 Often bicyclists fall victims of Motor Vehicle Accidents at their own fault or as a result of a car driver’s negligence. Accidents involving bicyclists can happen on the street, during mass bike races, and on bicycle trips in parks and forests. The bicyclists might sustain different types of injuries as a result of these accidents: concussion, neck, back and chest injuries, or different traumas and fractures. All these injuries may be accompanied by headaches, vomiting, psychiatric and psychological disorders, sleep, hearing and vision disruptions, and other medical problems, which may not begin immediately after the accident, but after some, even lengthy, amount of time. If a Bicycle Accident has happened to you, your relatives, or your friends, urgently call SLOMYANSKI LAW at 416-519-1006, or send a fax to 647-340-2899, or complete the form on our website in order to get a free consultation. You pay only after you receive compensation.